Flowtech Exhaust Products are the perfect combination of quality and value. 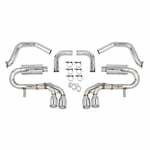 This Axle-Back Exhaust Kit fits the 1997-2004 C5 Corvette with the 5.7L V8 engine. Constructed of 2.5” 18-gauge, 304 Stainless Steel material maximizing strength and durability. Quality welds for strength, longevity, and good looks. High flow, straight through muffler design produces an aggressive exhaust note under acceleration and a mellow tone at idle. 4” polished 304 Stainless Steel Quad Tips adding maximum styling to your ride. Tube Geometry designed to use factory mounting points for hassle free installation. 1997-2004 C5 Corvette with the 5.7L V8 engine.